Asterisk is very different from other, more traditional PBXs, in that the dialplan in Asterisk treats all incoming channels in essentially the same manner. In a traditional PBX, there is a logical difference between stations (telephone sets) and trunks (resources that connect to the outside world). This means, for example, that you can’t install an external gateway on a station port and route external calls to it without requiring your users to dial the extension number first. Also, the concept of an off-site resource (such as a reception desk) is much more difficult to implement on a traditional PBX, because the system will not allow external resources any access to internal features. 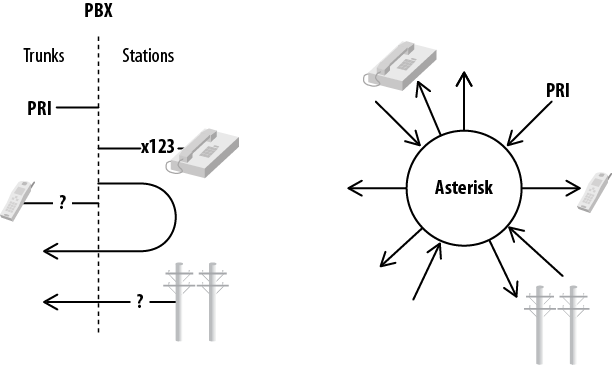 Asterisk, on the other hand, does not have an internal concept of trunks or stations. In Asterisk, everything that comes into or goes out of the system passes through a channel of some sort. There are many different kinds of channels; however, the Asterisk dialplan handles all channels in a similar manner, which means that, for example, an internal user can exist on the end of an external trunk (e.g., a cell phone) and be treated by the dialplan in exactly the same manner as that user would be if she were on an internal extension. Unless you have worked with a traditional PBX, it may not be immediately obvious how powerful and liberating this is. Figure 2-1 illustrates the differences between the two architectures. To be fair, many traditional PBXs do offer this sort of functionality. However, it is generally kludgy, limited in features, and requires complex, proprietary software to be installed in the PBX (such as vendor-specific protocol extensions).